CiteSpace is a freely available computer program written in Java for visualizing and analyzing literature of a scientific domain. A knowledge domain is broadly defined in order to capture the notion of a logically and cohesively organized body of knowledge. It may range from specific topics such as post-traumatic stress disorder to fields of study lacking clear-cut boundaries, such as research on terrorism or regenerative medicine. 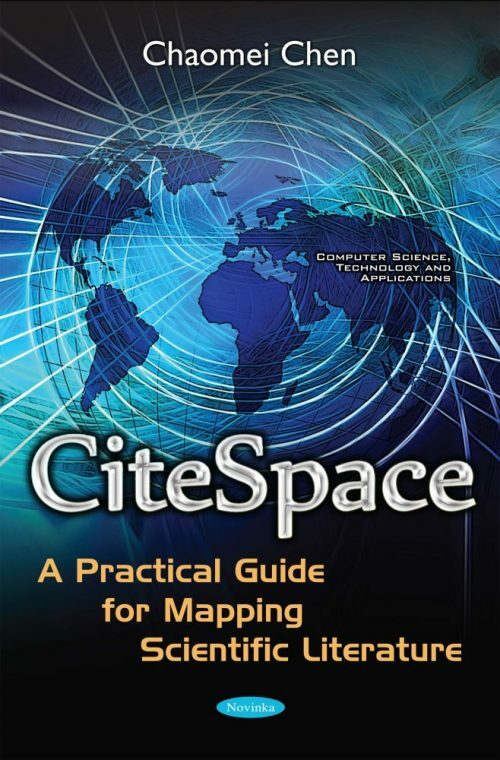 CiteSpace takes bibliographic information, especially citation information from the Web of Science, and generates interactive visualizations. Users can explore various patterns and trends uncovered from scientific publications, and develop a good understanding of scientific literature much more efficiently than they would from an unguided search through literature. The full text of many scientific publications can be accessed with a single click through the interactive visualization in CiteSpace. At the end of a session, CiteSpace can generate a summary report to summarize key information about the literature analyzed. Batagelj, V., & Mrvar, A. (1998). Pajek - Program for large network analysis. Connections, 21(2), 47-57. Brandes, U. (2001). A faster algorithm for betweenness centrality. Journal of Mathematical Sociology, 25(2), 163-177. Burt, R. S. (1992). Structural Holes: The Social Structure of Competition. Cambridge, Massachusetts: Harvard University Press. Burt, R. S. (2004). Structural holes and good ideas. American Journal of Sociology, 110(2), 349-399. Chen, C. (2004). Searching for intellectual turning points: Progressive Knowledge Domain Visualization. Proc. Natl. Acad. Sci. USA, 101(Suppl. ), 5303-5310. Chen, C. (2006). CiteSpace II: Detecting and visualizing emerging trends and transient patterns in scientific literature. Journal of the American Society for Information Science and Technology, 57(3), 359-377. Chen, C. (2011). Predictive effects of structural variation on citation counts. Journal of the American Society for Information Science and Technology, 63(3), 431-449. doi: 10.1002/asi.21694. Chen, C. (2012). Predictive effects of structural variation on citation counts. Journal of the American Society for Information Science and Technology, 63(3), 431-449. doi: 10.1002/asi.21694. Chen, C., Chen, Y., Horowitz, M., Hou, H., Liu, Z., & Pellegrino, D. (2009). Towards an explanatory and computational theory of scientific discovery. Journal of Informetrics, 3(3), 191-209. Chen, C., Cribbin, T., Macredie, R., & Morar, S. (2002). Visualizing and tracking the growth of competing paradigms: Two case studies. Journal of the American Society for Information Science and Technology, 53(8), 678-689. Chen, C., Hu, Z., Liu, S., & Tseng, H. (2012). Emerging trends in regenerative medicine: A scientometric analysis in CiteSpace. Expert Opinions on Biological Therapy, 12(5), 593-608. Chen, C., Hu, Z., Milbank, J., & Schultz, T. (2013). A visual analytic study of retracted articles in scientific literature. Journal of the American Society for Information Science and Technology, 64(2), 234-253. doi: 10.1002/asi.22755. Chen, C., Ibekwe-SanJuan, F., & Hou, J. (2010). The structure and dynamics of co-citation clusters: A multiple-perspective co-citation analysis. Journal of the American Society for Information Science and Technology, 61(7), 1386-1409. doi: 10.1002/asi.21309. Chen, C., & Kuljis, J. (2003). The rising landscape: A visual exploration of superstring revolutions in physics. Journal of the American Society for Information Science and Technology, 54(5), 435-446. doi: 10.1002/asi.10229. Chen, C., & Leydesdorff, L. (2014). Patterns of connections and movements in dual-map overlays: A new method of publication portfolio analysis. Journal of the Association for Information Science and Technology, 65(2), 334-351. doi: 10.1002/asi.22968. Chen, C. M., Ibekwe-SanJuan, F., & Hou, J. H. (2010). The Structure and Dynamics of Cocitation Clusters: A Multiple-Perspective Cocitation Analysis. Journal of the American Society for Information Science and Technology, 61(7), 1386-1409. doi: 10.1002/asi.21309. Deerwester, S., Dumais, S. T., Landauer, T. K., Furnas, G. W., & Harshman, R. A. (1990). Indexing by Latent Semantic Analysis. Journal of the American Society for Information Science, 41(6), 391-407. Egghe, L. (2006). Theory and practise of the g-index. Scientometrics, 69(1), 131-152. doi: 10.1007/s11192-006-0144-7. Freeman, L. C. (1977). A set of measuring centrality based on betweenness. Sociometry, 40, 35-41. French, B. M., & Koeberl, C. (2010). The convincing identification of terrestrial meteorite impact structures: What works, what doesn't, and why. Earth-Science Reviews, 98, 123-170. Garfield, E. (1955). Citation indexes for science: A new dimension in documentation through association of ideas. Science, 122(3159), 108-111. Hirsch, J. E. (2005). An index to quantify an individual's scientific research output. Proceedings of the National Academy of Sciences of the United States of America, 102(46), 16569-16572. doi: 10.1073/pnas.0507655102. Hirsch, J. E. (2007). Does the h index have predictive power? Proceedings of the National Academy of Sciences, 104(49), 19193-19198. doi: 10.1073/pnas.0707962104. Kessler, M. M. (1963). Bibliographic coupling between scientific papers. American Documentation, 14, 10-25. Kleinberg, J. (2002). Bursty and hierarchical structure in streams. Paper presented at the Proceedings of the 8th ACM SIGKDD International Conference on Knowledge Discovery and Data Mining, Edmonton, Alberta, Canada. http://www.cs.cornell.edu/home/kleinber/bhs.pdf. Newman, M. E. J. (2006). Modularity and community structure in networks. Proceedings of the National Academy of Sciences of the United States of America, 103(23), 8577-8582. Pirolli, P. (2007). Information Foraging Theory: Adaptive Interaction with Information. Oxford, England: Oxford University Press. Pirolli, P., & Card, S. (1999). Information foraging. Psychological Review, 106(4), 643-675. doi: 10.1037/0033-295x.106.4.643. Salton, G., Yang, C. S., & Wong, A. (1975). A Vector Space Model for Information Retrieval. Communications of the Acm, 18(11), 613-620. Shneiderman, B. (1996, Sept 3-6, 1996). The eyes have it: A task by data type taxonomy for information visualization. Paper presented at the IEEE Workshop on Visual Language, Boulder, CO.
Small, H. (1973). Co-citation in the scientific literature: A new measure of the relationship between two documents. Journal of the American Society for Information Science, 24, 265-269. Takeda, Y., & Kajikawa, Y. (2010). Tracking modularity in citation networks. Scientometrics, 83(3), 783. White, H. D., & Griffith, B. C. (1981). Author co-citation: A literature measure of intellectual structure. Journal of the American Society for Information Science, 32, 163-172. Wignall, P. B. (2007). The End-Permian mass extinction - how bad did it get? Geobiology, 5(4), 303-309. doi: 10.1111/j.1472-4669.2007.00130.x. Anyone who is interested in getting first-hand experience in science mapping and systematically generating overviews of a scientific domain. Anyone who is interested in learning and using CiteSpace effectively. Any scientists, researchers, scholars, and students who are interested in the history and the current status of a scientific topic or a field of study.